An asylum from mediocrity and haven for abnormality. I happened to discover Kotonoha no Niwa while I was on Tumblr. While scrolling I came across a couple of gifs portraying visuals from the film, and I almost immediately disregarded them as just some neat shots of nature. Then as I continued to scroll my eye happened to catch the word “anime”. Immediately I viewed the images again and I was taken aback to realize that the imagery I was watching was in fact animated. Straightaway I looked up the source of these beautiful graphics and watched the movie. I knew that even if the film was to fail on a narrative level in my eyes, I’d at least be pleased based off of the imagery alone. As it turns out, I was immersed into both. The film focuses on two protagonists: Takao, a fifteen-year-old high school student who struggles between childish delights and a desire to grow up so as to achieve his dream of becoming a shoemaker; and Yukino, a twenty-seven-year-old woman who shares Takao’s aspirations to mature and progress, but lacks his ambition and confidence to do so. The two meet on a rainy day (the first of many in the Kanto region’s rainy season) and over the course of the film a romance of sorts buds between them as they learn more about each other and themselves. Kotonoha no Niwa is a short movie at only forty-six minutes long, but it manages to flesh out its characters and their relationships notably well in its timespan. The character’s dilemmas are ones that are easily emphasized with—making their relationship believable despite the age difference between the two. Their manners of thinking and behavior are testaments to their true ages, but how they view and react to their situations also reveals their maturities and immaturities. The “romance” between the two is the secondary focal point of the movie, and it’s handled with finesse—as a relationship of this type must be. There’s a level of sensuality that’s established without becoming creepy, and the ramifications of their relationship going too far is a plot point also handled with tact, never tarnishing the innocence the movie airs, nor overshadowing the main themes. The primary focal point, however, are the visuals. 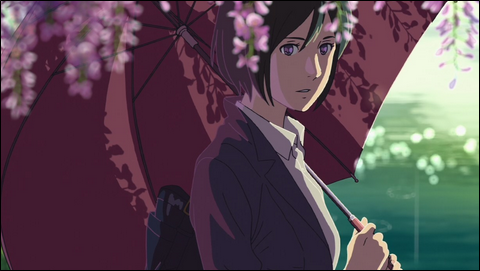 Kotonoha no Niwa is one of the most gorgeous animated films I can recall seeing. While I don’t claim to know how it was animated, there appears to be a blend of computer generated imagery and hand-drawn that creates visuals that blur the line between the surreal and the real. Throughout the film are various unique shots that show off the amazing artistic design with imagery of nature. Most of the environment almost becomes characters in itself—especially the rain. With its beauty and relevance in the story, I’d argue it is a character. This is without even mentioning the beautiful score by Daisuke Kashiwa. The movie proved itself to be one of both visceral and visual depth, and with such a brief running time, it lends itself to be viewed again and again without oversaturating the audience.